For most of the animal lovers we just don’t treat animals as animals as they are more than just pets—they’re members of the family. When they pass on, we grieve our deceased pets intensely and their absence leaves a huge hole in our hearts. While they may no longer be with us physically, we can still keep their memory alive. 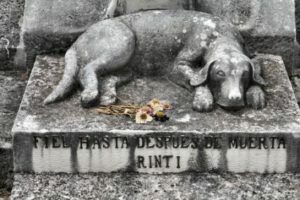 If you’ve lost a dog, cat, bird, snake or another kind of pet, you’ll want to explore these seven creative ways to honor their memory. When your pet has passed on, remember him or her by hanging your favorite picture of them in your home (or on your desk at work). Having a visual reminder may make you sad at first but you’ll soon smile every time you see your animal’s sweet face. Take the first idea up a notch by asking an artist to draw, paint or even sculpt your pet. You can share photographs of your deceased pet and work with someone to create a timeless, one-of-a-kind piece of art to cherish and display. Devote a small table or corner in your home to your deceased pets using special objects and keepsakes. You might create a shrine using a food bowl, collar, and a few photographs of him or her with a candle. This area could also become a great place to meditate or simply contemplate life. This requires a bit of forethought before your pet passes. Consider having your pet step into a square of cement in your backyard (or use a clay kit to make a more portable mold) so you can have his or her paw immortalized. If your pet has already passed, you can always create a paw print yourself and draw his or her name beside it as a symbolic tribute. Consider wearing your deceased pet’s name tag on an anklet or bracelet, or just keep it in your jewelry box for a subtle, tangible reminder of his or her life. Each year, you can honor your deceased pets by continuing to celebrate their birthdays. Say a few words about what they meant to you and perhaps buy or make their favorite treat—you can share it with your new pet or a friend’s pet as a way of marking this special occasion and showing that you still have love to give to other animals in your life. Pay it forward to other pets and animals in need by choosing a cause that’s important to you—like your local humane society or the World Wide Fund for Nature—and giving what you can in your pet’s name. You can also schedule regular donations! This certainly allows your deceased pets to leave legacies that go beyond your family and help other animals enjoy better lives. Next Do You That You’re A Medium?